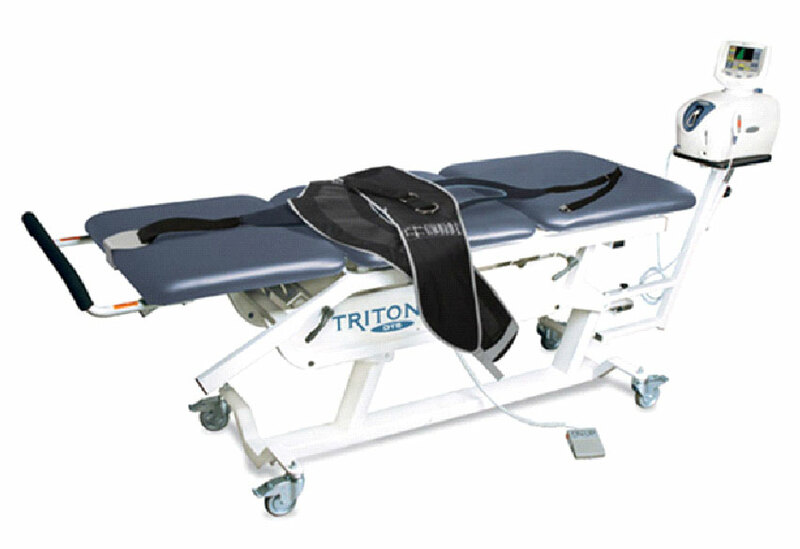 The Triton Decompression Traction System (“DTS”) is an essential element of successful physical therapy, using safe and effective FDA-approved equipment, for patients suffering chronic back pain or recovering from back, neck or spinal injuries. DTS is effective at treating muscle spasms, bulging discs, herniated discs, pinched nerves, sciatica, radiating arm pain, headaches, and facet syndrome. Spinal decompression traction is essentially a method of stretching your body to relieve the pressure that builds up in the spine through various causes, including injury, obesity, inactivity and over-taxing of the cervical and lumbar muscles. The DTS uses gentle intermittent distractive forces, thereby creating an unloading and separating of the joints of the spine. Because the DTS procedure works best when a patient is relaxed, the Triton machine is designed to activate only when a patient’s monitored EMG reading descends to the target number. To reduce guarding and to provide better comfort for acute patients, the system is designed to begin with a pre-tension phase. The pull patterns are designed to replicate as closely as possible the manual therapy experience. Variable motor speeds and independent timer control for pretension, progression, traction and regression increase treatment flexibility. There are static, intermittent and cycling traction options. These pull-relax patterns create a suctioning effect on the disc, much like pulling a balloon from both ends, and the middle portion narrows as a result. The goal of DTS therapy is to reduce the pressure on the nerve, most commonly from a herniated or protruding disc. DTS therapy also decreases muscle spasms and muscle guarding, and breaks up adhesions, in order to facilitate increased range of motion and decrease pain. DTS also helps improve blood flow and nutrient exchange at the disc, which results in pain relief, improved healing, and slower degeneration. 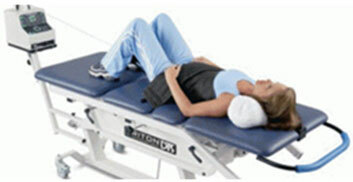 The DTS is pre-programmed with Clinical protocols for cervical and lumbar traction, and there are an additional 80 slots for user-defined protocols, meaning that you and your therapist can choose the setting best suited for your needs. The DTS also has the ability to save patient treatment sessions on Patient Data Cards, which record patient pain mapping, pain scales, and pain types all from the unit to the card. This feature allows your therapist not only to check your progress, but also to use the data to determine ways to optimize the treatment further by targeting areas of particular concern in future sessions. The DTS is best utilized as an adjunct to regular chiropractic treatments and kinesiological analysis to understand the causes of your back pain and address them systematically. Many spinal decompression patients experience significant recovery in just a few months, thereby avoiding the need for risky surgical procedures. Scarsdale physical therapists, who have undergone extensive medical training on the proper use of the DTS, are experts on using the adjustment settings and belts to select the best program and to position patients correctly on the table. Knowing the right buttons to push and the right way to place the patient’s body are critical factors in the success of DTS treatment. We got your back!